It’s one of the most beautiful places in the world, and certainly one of its deadliest. Aokigahara, otherwise known as Sea of Trees or Suicide Forest, was formed on top of a lava flow after Mount Fuji erupted in the year 864. While lovely, Aokigahara is an eerie place. Though the forest is lush, it is strangely absent of the bird song and animal chatter you’d expect to find. What does exist is muted and hushed. Compasses don’t work in the forest, and many travellers have gotten hopelessly lost. 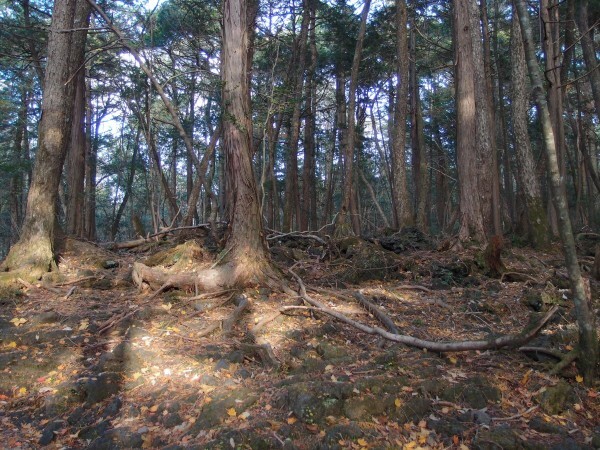 These facts are strange, but they’re not the reason Aokigahara is famous. The forest got its sad reputation from all the people who have gone there to commit suicide. For decades, at least one hundred people have lost their lives in Aokigahara each year. In the 2000s, the Japanese stopped publicizing the body count, for fear the numbers encouraged others to do the same. It is believed many more than a hundred die there per year–due to the sheltered nature of the forest, it is difficult to recover all the bodies. As you walk through the forest, you may stumble upon a row of shoes, or a doll, or even a backpack. Many colours of plastic landscaping ribbon wind their way along the trails, marking paths in case the suicidal change their minds and wish to find their way back. During his patrols, Hayano tries to prevent suicides. Most of those who die in the forest hang themselves, and he was able to save at least one young man and talk him out of killing himself. There is also a number for the local suicide prevention association. However, it is not the locals who are killing themselves. Hayano says that those who live in the area are taught as children to stay away from the forest. Aokigahara had a dark reputation before the suicides. Legend has it that the forest was once used for the practice of ubasute, or leaving one’s elderly parents to die. Why do you think the forest compels people to commit suicide? Would you ever dare to visit such a place? – With info from Suicide Forest. This is a beautiful documentary about Aokigahara that features an interview with Hayano, but it is depressing and a little disturbing. Warning: it shows photos of some of the corpses found in the forest. That’s really sad. I wonder why everyone goes there. Why they started and chose that forest. Strange. I think it’s become known as the “place” for suicide now, but how it started out that way, no one knows. There’s definitely something off about it, considering the fact that there’s barely any wildlife and compasses are thrown off. Maybe there’s something that works on human brain chemistry, but most people who commit suicide there go to the forest with that intention already. I’d heard the story of it before. Hate to be a ranger for that park. People took their parents there to die? That is depressing. In poor economic times, it became a habit to leave one’s elderly parents there rather than pay to support them. Very sad, yes. Some Japanese believe the forest is haunted by these vengeful ancestors, and/or inhabited by demons. How utterly fascinating in a sad kind of way. It makes me wonder–is it just a social phenomenon, or is there some kind of energy that, well, compels people to go there to end their life? And I actually would like to visit it. Maybe not walk through the forest, but just go there and see if there is something about it that defies explanation. Welcome to my blog, and thanks for signing up! That means the world to me. I think there must be something that compels them. The geologist on the documentary can’t explain it–he spends a lot of time there and says it’s a beautiful forest. Perhaps it’s the power of suggestion, but how did it start in the first place? Just the name “Suicide Forest” would creep me out! Saw a documentary last year about it, that was sure shocking. No, I doin’t think I’ll have the nerve to walk there. The reporter said about what was written on the sign “but what if these people were the cause of his coming here to kill himself?” he meant people needed a higher connection than to other mortals, I believe he’s right. So sad because I never imagined Japan would have such a scary rate of suicide. And it’s not just the Japanese, either. Now some foreigners are coming there to kill themselves. It really is shocking. I thought it was spooky at first, but once I started researching it, it was just sad. What a heartbreaking story…and an eerie, haunting place. I agree, Nadine. Thanks for visiting and commenting. Welcome to my blog! When I was researching my first book, I found reference to this place and others. Japan always popped up in search for information on suicide. Seppuku is an ancient tradition, but usually connected with honor. It would be interesting to find out how that ancient perception has altered over the centuries, yet still influences modern youth. Young people were always the most common suicides in that country. They even had suicide parties. People who didn’t know each other connected on the internet, met, and took their lives. The geologist in the documentary talks about this–about how it used to be for honour, but he says that isn’t the case any longer. Now people are killing themselves because they “can’t make it in society,” as he puts it. Perhaps there are still cultural drivers for this. Thanks J.H. This is profoundly disturbing. A dead forest where people who are already dead in a psycho/spiritual/emotional sense. It – the forest – must have a pull, the eeriness if it all, the dead trees and the history of it. I agree, Susan. There’s definitely something pulling them there. I think it’s probably a case of word of mouth self fulfilling prophesy that turned into a sort of pilgrimage spot for the suicidal as it gained in notoriety. Eerie as hell and it would be a great backdrop to horror stories but this is one where I believe the demons that are their come with those who visit. I agree, Frank, although apparently people have been doing this in the forest for at least a hundred years. Could be word of mouth, most definitely, although they aren’t locals. It’s certainly strange, but most of the people who die there are coming to die. It would be even more horrible if random tourists suddenly had an irresistible urge to kill themselves. There have been some concerns about that, but I guess the government felt they had to do something. This is incredibly sad, yes. I agree with Haneen that the sign probably wouldn’t inspire many to reconsider (especially if those people were the catalyst to their hopeless feelings). A gift from parents they’re at odds with? – not likely to be as compelling as ‘a gift from God’ (who you’re about to see very shortly and have to explain this to). Your post actually does make me want to visit the forest. Mostly I’m curious if there’s anything immediately creepy about it. It’d be interesting research for writing spooky forests too. What a neat blog topic! Thanks for your insightful comment, Donelle. In Japan, Shinto and Buddhism are the main religions, so “a gift from God” would not have the same meaning there as it would here. In societies like Japan’s, family honour usually means everything, so I’m guessing that’s why they chose that wording. Personally, as an agnostic, a reminder of my family would mean more to me and have a better chance of changing my mind, but if I was determined to kill myself, perhaps not. I’m glad you enjoyed the post. 🙂 It is an intriguing location, even though it’s horribly sad. That’s true. Shinto and Buddhism put more emphasis on ancestors. It’s a good idea to remember your family at a time like that because they’re the ones it affects after you’re gone. Do people outside Japan travel to that forest or just Japanese? I think it’s primarily the Japanese who are killing themselves there, although not locals from the area. There was an episode of Destination Truth where they went to the forest and did a night investigation. I don’t think they found any ghosts, but it was a creepy episode. It definitely would be. I found the documentary itself to be quite sad–haunting in a different way. There are places in the world that echo a deep sadness. This seems to be one of them. Just reading about it makes me want to heal those sad souls who felt there was no way to live. Me too, Bonnie. It’s a sad place, to be sure. If you have time, watch the documentary. I think you’d like it. The man being interviewed tries his best to intervene. Yes, it is very disconcerting. If you remember the book, please let me know. And thanks for commenting, Madeline! Your whole theme is really awesome. Thanks so much, Heather! That’s so kind of you to say. This is my regular theme, but it’s been fun to do for the A to Z Challenge. Thanks for visiting my blog, Mike. Did you watch the documentary? It’s very sad. In Alaska and other such places, in the olden day’s it was expected of the elderly. Who can no longer contribute to the upkeep of living in a village are expected to just leave and disappear. Especially in times of lack of food and strife. And most of the times it was voluntary .I also know of stories my Uncle told of older Grand-mama’s laying down their life so the children would not starve. Such an eerie, disturbing place, so full of sadness. With so many previous suicides, could people be influenced to kill themselves by the restless spirits of those who passed before? Just a thought. Your feature makes me want to read more about the forest than the movie release a couple years ago did. Thanks for the compliment, Dave. Much appreciated. I think you’ll enjoy the documentary, if you haven’t already seen it. Talk about an eerie place, or one that might be haunted! I truly wonder whether my curiosity would get the best of me if I were to face this forest one day… Hard to tell whether I would venture in from the comfy spot I am reading this. But, being a ranger in this forest would not be a job I’d apply for. Fascinating story! Would you go for a stroll here, JH? I think I would, for sure, but I’d want one of the rangers with me. Not because I’m in any danger of committing suicide, but in order not to get lost. One of my favorite albums is titled Aokigahara, and its tone is so somber, I can almost picture what it might be like to be near that forest. I do think it is tragic and sad so many have chosen to end their lives there, but I would certainly like to visit. Just to feel the atmosphere for myself. I would visit this forest for sure..but with someone:) I think part of the issue is this place now has a reputation so people go there for the reason to kill themselves. I wonder if there is something in the earth that is “metallic” or something that makes the compasses go nuts. This same problem might go undetected by us but wildlife have keen senses of smell and direction so they may know enough to stay clear. Have any scientists ever looked into the ground from the old lava flow? Hmm…good question, Birgit. To be honest, I’m not sure. I’d have to do more research. But I agree the reputation definitely plays a role. I’ve heard of this forest, and it’s both intriguing and sad. Agreed, Gina. And I love your url. I think it’s Japans version of the Golden Gate Bridge. For one reason or another, certain locales become meccas for suicide. I’m sure the isolation there is a factor as well. It is strange. And then there’s that bridge in Europe where dogs commit suicide in epic numbers. So bizarre. Interesting post, as it reminded me of an amazing woman I have not seen in decades. I had a good friend in college who was half Japanese. The subject of the high rate of Japanese suicide was in the news. She explained that in the Japanese culture there was no shame or stigma attached to suicide, as with those raised in a Christian society. In fact, the act was seen as honorable when circumstances are such that the family is brought to shame. Being surrounded by their ancestors in the forest would not be creepy to those with that mindset. I learned a lot from her about seeing things through another set of eyes. Good point, Lee. While I don’t think a high rate of suicide is a good thing, or something to strive for, the stigma suicide victims and their families face in our society is so horrible and unfair. If you’ve never been to the brink, it’s almost impossible to understand how people feel when they’re there. I’d never heard of this place until now. This is so sad. I want to stand at the edge of the forest and hug everyone who tries to enter and persuade them not to give up on life. I don’t think I could bear to watch the documentary, although I imagine it would be fascinating. It’s really haunting and sad, Ellen. I like your idea of giving every visitor hugs. Perhaps that’s all they need, just that one perfectly timed moment of love and compassion. Could be, Debbie. I’d certainly prefer that than to think there’s a place that compels people to kill themselves against their will. Personally, I would go in without hesitation. Suicide is not an act that someone performs without a lot of thought. I do not believe a sign is going to matter one way or the other, no matter what it says. I think that the draw to the forest IS because of the silence and the sense of disconnection. Suicide is not taken lightly be it for escape or honor or whatever reason. A slow walk through the silent trees, no need for direction, and no wildlife distractions would allow you to delve deep into your own psyche and learn your reason for being there. Some people walk out. Some people don’t. There are not many places in the world where such solitude and isolation can be found. Its the perfect place for reflection. And if you have ever seen pictures or video, it is stunningly beautiful. I think it not eerie or sad. Just quiet. Nicely put, Of a mind. Thanks for commenting. What evil dwells there that would draw people to it? Sad and scary. Good question. At this point, it’s probably the fact that so many have taken their lives there. I love being in any forest, and while not suicidal at all, I can kind of understand wanting my last moments to be outside, among the trees. I find this forest fascinating and I think I’ve seen the video you mention. There is another one where someone just takes a walk through the forest to show people it is not all about death that I haven’t seen yet. The movie featuring the forest that came out a few years ago was so-so. It is a fascinating place, and that documentary is haunting. It hits you that this isn’t just a creepy story; it’s real people taking their lives. So sad. I haven’t seen the movie based on this forest, so I don’t know if they filmed on location. I hope the fame of the move does not drive more people there. Why would it matter if people went there or somewhere else to commit suicide? People get a herd instinct about the oddest things. If a person goes to a place know for suicides, it could become easier to go through with it. I highly doubt they filmed on location, unless you’re referring to the documentary I linked to in my post. That was made on location, but any fictional account was undoubtedly shot elsewhere.